In the heady world of film criticism it is an intriguing (and vaguely amusing) anomaly to find films that have to them nothing particular of merit on paper yet which in practice are not only worth watching, but worth purchasing in order to view again. Such a case is Calculated Risk, a low budget British ‘B’ movie from 1963 directed by Norman Harrison (no relation) and starring William Lucas, John Rutland, Dilys Watling and Warren Mitchell (in his pre-Alf Garnett days, naturally). Shot in the early months of 1963 (the so-called ‘Great Freeze’), the film’s use of minimal interiors and significant location shooting is one contributory factor to its powerful impact. As befits a film of 69 minutes running time, the premise of Calculated Risk is a not overly original one, but the way it is told is. Kip, after a lengthy prison term, is released back into a society that has changed following the death of his wife. With economic times being hard, Kip is tempted to pull one final job…and seeks to recruit a willing band of helpers for a heist which is tricky but do-able. With such a plot the pacing is allowed to develop organically- the tension increased somehow by the crisp clear nights and the soft crunch of snow. Almost from the first shots of the film- the prison and Kip’s release through to the churchyard covered in snow as he visits his wife’s grave- there is a feeling of quality, somewhat surprising given the film’s meagre budget. But, perhaps there is an inescapable romance in the desire to be richer than one could realistically dream of- in the way we empathise with Henry Holland in The Lavender Hill Mob (1951) and wish him to succeed, so (I would argue) we wish the men of Calculated Risk success also- even though their method of getting rich quick is an illegal one. Director Norman Harrison draws us effortlessly into the world of thermos flasks, outdoor markets, bobbies on the beat, limited employment, terraced houses and repressed sexual desire. Would the film work today? Probably not. It works because of its time- the aftermath of World War II and a Britain still struggling to get into its stride (we had not yet reached the true maelstrom of the ‘Swinging Sixties’). There is also no recourse to bad language (which would surely populate an unwise re-make). Finally, the running time would (out of modern, commercial necessity) be expanded- to the detriment of what is currently a tight, taut thriller. The only potential area for improvement is the ending- the momentum seems to be lost somehow, and a slight re-edit would not have led to this. Despite this, Calculated Risk utilises its time- its era- fabulously; the carpet of snow is as real as the characters and the plot- and all these elements collide in a film which is an underrated classic of early 1960s British cinema. 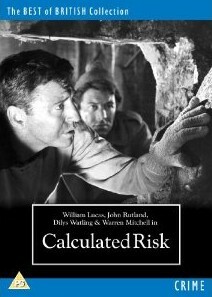 ‘Calculated Risk' is available on DVD from Odeon Entertainment.